Started in 1988 as a sales and systems integrator of motion control products, Lansea Systems Incorporated (LSI) has evolved into a leader in sales and distribution of precision motion control technology. 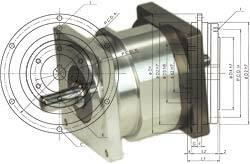 LSI offers a complete line of carefully selected speed reducers, including zero backlash reducers and couplings, servomotors, and electronic drive products to meet today's demands in performance and price. Also, pneumatic indexers featuring precision positioning are available to complement our electromechanical and electronic drive products. In addition to being a source of products, Lansea Systems Incorporated is also considered by our customers as a resource of information and applications assistance. LSI provides products and services in a timely manner and promotes a partnering relationship with our customers. Since 1996, Lansea Systems Incorporated has been the exclusive North American distributor for Kamo Seiko Corporation. Featuring mechanical and pneumatic products designed for precision positioning, Kamo Seiko offers performance at a reasonable price. With our network of distribution, you can count on a partner being nearby to assist in your application. This page copyright © 2003-current by Lansea Systems Incorporated. All rights reserved.